This agriturismo is located in Colle di Val d'Elsa, in a medieval borgo in the middle of the Chianti hills. The borgo consists of various rustic houses and a garden. The swimming pool is encircled by a sun deck and surrounded by a lawn and mulberry trees, pines, oaks and cypresses. 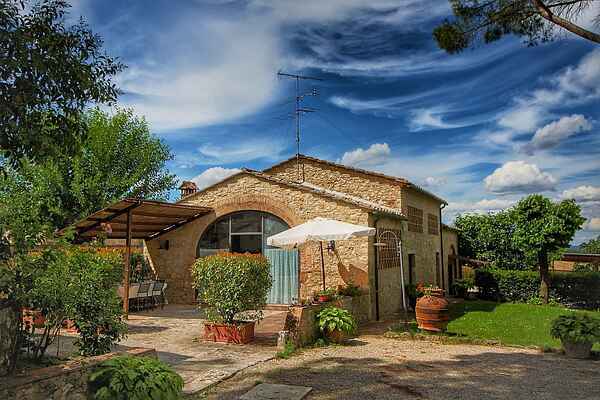 The borgo is set in the midst of vineyards and olive trees. There are 12 apartments in total, all well restored and furnished in a country style with a lovely ambience. The terracotta floors and wooden ceiling beams add to the authentic atmosphere. The borgo is surrounded by nature, making it the ideal spot for a tranquil and relaxed holiday. The location is strategic, since the village of Colle di Val d'Elsa is just 5 km away. The beautiful little town of Monteriggioni is also a short distance away. San Gimignano, with its famed towers, is certainly worth a visit as well. Siena and Volterra are 30 km away. The agriturismo produces and sells white Charonnay wine, red Chianti and grappa.